W x L 52 x 50"
W x L 69 x 68-1/2"
Click here to see more Box Dumpers! Our hydraulic box dumper, Tote Dumper or Box Tipper offers a great ergonomic solution for dumping heavy loads and material handling. A dump hopper also offer a great solutions for dumping. 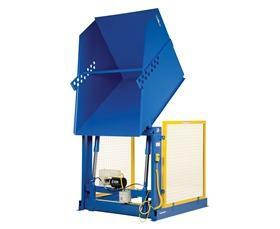 Nationwide Industrial Supply is a national distributor for dump hoppers preferred distributor for Vestil.